Michael Gerhartz, born in 1974, is a native German. During his time with the police, he followed his passion as a scuba instructor, before moving to Canada in 1999. Michael is now spending his time as a scuba instructor, tour guide, underwater photographer, and in the security industry, but also commits to scientific diving and environmental awareness. He resides with his wife and two dogs in Cape Breton, Nova Scotia. Michael Gerhartz is the author of THIN ICE and DARK TIMES, both novels focusing around the young and adventourus Natascha and EuroSec Corporation. He has had book readings in major Canadian cities as well as in Germany and during the FEIS Literacy council. Prior writing novels, Michael’s articles and underwater images were published in several scuba magazines. In Dark Times by Michael Gerhartz, we meet Natascha. Once framed as a most-wanted terrorist, all Natascha wants to do now is live her life with Nick and the daughter they have together. She works part-time as a marine biologist at the London Aquarium and as a secretary for a security company but when she gets involved in a scientific expedition, things turn nasty. Finding herself in a flooded mine underneath an old abbey, she learns a secret that the clerics don’t want anyone else to know. Natascha now has her work cut out to stay ahead but her past is about to catch up with her. Nick and some friends follow her but they must solve the mystery if they are to find Natascha in time. 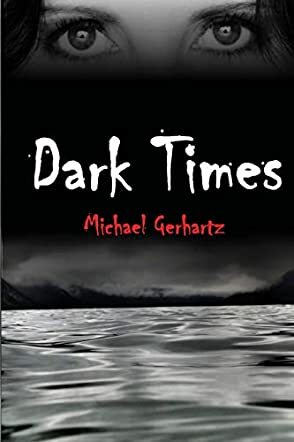 Dark Times by Michael Gerhartz is a thrilling story from start to finish. The very first page hooks you and pulls you headfirst into an adventure that will leave you breathless. Just when you think you’ve got it all figured out, off you go in another direction, down another path with more clues and more intrigue. This is a fantastic book, really well written with some great characters in it. It is properly paced, with plenty of action and suspense that leave you guessing right to the very end. There’s a whole range of emotions in this story and you will struggle to put it down. I thoroughly enjoyed the book and am really looking forward to the next one. Highly recommended for fans of thrillers or those who just want a really good story to lose themselves in. Dark Times is a work of dark, suspenseful thriller fiction penned by author Michael Gerhartz. Beginning with a chilling moment as two teenagers flee from a mysterious abbey, the action soon turns to Natascha Rehfeld, a woman determined to put her past behind her after being cleared of false terrorism accusations. It turns out that, even so, her next scientific expedition leads her back to that same abbey where a flooded mine holds terrible secrets that should never have seen the light of day. From there, the action turns global as the plot thickens and it’s up to her partner Nick to trace Natascha and discover the truth. Author Michael Gerhartz has a strong sense of character which really aids the realism of this epically-scaled criminal puzzle. Part mystery, part thriller and even part horror novel in its tone, the plot unfolds like a carefully laid trail as Natascha’s past catches up with her and forces her to once again abandon her attempts at a peaceful existence. The prose is crisp and action filled, with some excellent descriptive moments which give the scenes a cinematic quality, and the dialogue between characters is both plot revealing but also naturalistic as it moves the story forward into the next section. The conclusion was also satisfying both on the character level and for the story as a whole. Overall, I found Dark Times to be an exciting and enjoyable read really suitable for all thriller fans, and it’s definitely a recommended read. Dark Times by Michael Gerhartz is a thriller with entertaining twists that will appeal to fans of mysteries. Her name has been cleared and she doesn’t have the tag of a terrorist on her. So, all she desires is a quiet life with Nick, her bodyguard, and their daughter. But Natascha’s career as a marine biologist and secretary for the security company, EuroSec Corporation Team A, thrusts her onto a path she thought she’d put behind her. In an expedition, she uncovers secrets buried in a mine beneath an old abbey, secrets that men in religious robes have concealed from the public. But this is just the tip of the iceberg for there are far more sinister secrets linked to this than she could have imagined. Now, she knows a lot, powerful enemies are after her, and they are as well equipped as they are skilled. Nick quickly find himself on a mission to rescue Natascha, but can he and his friends unravel the clues and get to her in time? This is an imaginative, compelling narrative with plot points that are strong and twists that get readers more and more intrigued as to how the story will evolve. Michael Gerhartz grabs the interest of the reader and sustains it with his strong gift for character and plot. It is a thoughtful thriller, character-driven, with a great setting that takes readers to exotic and exciting places. The plot is seasoned with elements of mystery and a sense of danger that keeps readers awake, following each step of the protagonist. Dark Times is told in a clear and exciting voice, featuring prose that is excellent. I loved the author’s unique turn of phrase. The conflict is well developed and evolves quickly, escalating into a crisis. This is a narrative for fans of thrillers and readers who are looking for well-developed and rock-solid characters. Dark Times by Michael Gerhartz presents a refreshing voice that will resonate with fans of thrillers and mystery. Natascha has just recently been cleared as one of the most wanted terrorists and all she wants is to settle down with Nick, her bodyguard, and their daughter, Shira-Sarah. Her work as a marine biologist and secretary of a reputable security company thrusts her into the heart of a conspiracy that puts her life in the balance. She has just unveiled a powerful secret, hidden in a dark cave beneath an old abbey, and while she is shocked about it, she quickly discovers that it is just a piece of an even greater, more sinister scheme. Her life is in danger and there are powerful forces coming after her and they are just so good at their game. To save her, Nick and his friends undertake a perilous journey that follows her trail across diverse lands, London, the Aegean, Monaco, and the Mediterranean. It begins with an engrossing prologue, with two teenagers running through the cold night as fast as they can along the outside walls of Whitmore Abbey. The prologue ends with an intriguing line: “Cathy forcefully turned around and ran through the forest, determined to get as far away from the abbey as she could.” And that was the hook for me. I wanted to know why a young girl would feel so scared of a place that should offer peace and solace and a sense of proximity to God. The reader is introduced to a cast of compelling characters, including Nick and Natascha Rehfeld, Sean MacLeod, Jack MacDonald, Ariel Rashid and many others. Each character has a solid background, with deep roots in the security or military service. The plot is well imagined and deftly written, with surprises that take the reader’s breath away. Michael Gerhartz knows how to hold the reader’s attention and sustain it from page to page. The action is intense, and it begins from the first page. Dark Times has an irresistible spell that only a master storyteller can cast. It is absorbing. Dark Times by Michael Gerhartz is a riveting thriller. Twenty-nine-year-old Natascha Rehfeld is recovering from being framed for a crime she didn't commit. She lived in hiding and was considered one of the world's most wanted terrorists. Now, having been cleared of wrongdoing, she settles down to a relatively normal life working as a part-time marine biologist for an aquarium and secretary to EuroSec Corp, an elite security company. Her former bodyguard, Nick, is now her husband and they have a daughter called Shira-Sarah. However, her life is about to be turned upside-down again when she becomes involved in another scientific expedition, this time to investigate a flooded mine under an old abbey. The abbey holds secrets that are connected to her past and, as the title of the book predicts, dark times really are in store. Michael Gerhartz writes a fast-paced novel with a fascinating and very well orchestrated plot line. There was a cast of international characters which were interesting and intriguing. The main protagonist, Natascha Rehfeld, was strong and feisty which is absolutely essential in a thriller. Her personal story was the thread that held the book together and it was really engaging. The book is quite long but the complex and engaging narrative is good enough to support this. What I liked about the book was the fact that I couldn't predict what was coming next. I found this very refreshing. If you like an action-packed story to really get your teeth into, Dark Times is the one for you.